This music appreciation program explores through musical performance the influence of immigration on traditional Italian, German, Celtic, French Canadian and Cajun music. The program features accordion, dulcimer, cedar flute, guitar, harmonica and vocals. In her novel, Accordion Crimes, Annie Proulx tells the story of an Italian accordion maker who comes to America in the 1870s with dreams of fame and fortune by making accordions. Instead, he is murdered and his accordion is stolen. The book tells how his green accordion makes its way around the country and the music it plays in the different regions: German music in Minnesota, Norteña or Tex Mex in southern Texas, French Canadian up in Maine, and Cajun in Louisiana. 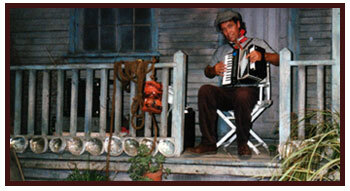 In October 2005, Jim was invited by a Professor of Literature at the College of Creative Studies of the University of California, Santa Barbara, to present a literary symposium about the accordion with a literary theme. Jim developed a lecture demonstration, based on Annie Proulx's novel and is his version of a soundtrack to the novel. The program includes traditional European accordion songs: Italian, German, Spanish and Celtic and traces how the music developed and changed when these different groups came to America. The intermingling of influences, including Native American, created a dynamic and interesting ebb and flow. Accordion music was affected by these varied musical traditions, and in turn also influenced the development of various regional musical styles. The accordion was a universally popular instrument in Europe, having developed initially in Italy and/or Germany (they're still fighting about it). It was used for all types of celebrations and its popularity spread throughout Europe. New immigrants to America brought their accordions with them, and the instrument adapted to the new cultural environment while maintaining strong ties to traditional music -- as an example, Italian music played in Italy and the music played later by Italian immigrants in New Jersey have both similarities and differences that show the uniqueness of the accordion music that developed in American immigrant communities.